What does it mean to be human in an age of machines? In his 1854 book, Walden, Henry David Thoreau wrote, “Men have become the tools of their tools.” Thoreau’s assertion is as valid today as it was when he made it over one hundred and sixty years ago. Whenever we shape technology, it shapes us, both as individuals and as a society. We created cars, and cars turned us into motorists, auto mechanics, and commuters. Over the centuries we’ve populated our world with machines that help us do things we can’t or don’t want to do ourselves. Our world has become so saturated with machines that they’ve faded into the background. We hardly notice them. We are reaching a new threshold. Our machines are getting networked, and enabling new forms of human machine symbiosis. We’re entering a new era where fifty billion machines are in constant communication, automating and orchestrating the movement and interactions among individuals, organizations, and cities. Institute for the Future (IFTF) is a non-profit think tank in Silicon Valley, that helps organizations and the public think about long term future plans to make better decisions in the present. Mark Frauenfelder, a research director at IFTF interviewed Rod Falcon, IFTF’s Director of the Technology Horizons Program, which combines a deep understanding of technology and societal forces, to identify and evaluate these discontinuities and innovations in the near future. Rod discussed Tech Horizon’s recent research into how machine automation is becoming an integrated, embedded, and ultimately invisible part of virtually every aspect of our lives. What was IFTF’s motivation for exploring what automation might look like in the future? As we design new things, new services, and new experiences with technology, how can we design those with principles that optimize for symbiosis? Right now, a lot of our machines and technology experiences are encoded with notions of productivity, efficiency, and optimization, but different possibilities open up when we think about encoding those systems with values and principles that ensure equity and inclusivity. The Automated World Project looked at the way machines can change our behavior in ways that we didn’t anticipate. Could you talk about that? We often underestimate how we accommodate technology in our lives and how it changes the way we go about our lives. Technology often disappears into the background. For example, we don’t think of clocks as a technology. If we take a step back and look at clocks in our lives today, they’re pervasive. They’re everywhere. They’re next to our beds, they’re on our wrists, they’re on our phones, they’re on our microwaves, they’re in our cars. The role of clocks is supporting our productivity and efficiency. In many ways, clocks govern our lives but they also help us connect with one another. It’s because of clocks I can say, “Let’s meet today at two o’clock and have this interview,” and we know where to show up. Clocks have become a coordination platform that all of us know how to use. Clocks are a good example of how technologies also evolve. It turns out that clocks weren’t always a technology for efficiency. One of the earliest mechanical clocks was created in the twelfth century by Al-Jazari, an Islamic scholar and inventor, who is considered by many to be the father of robotics. Al-Jazari’s clock wasn’t for productivity, it was built to serve as a reminder for adhering to religious ceremonies, customs, and rituals. It was not until the industrial revolution that the the role of the clock changed from a religious technology to a work and coordination tool. As part of that transition, we humans also became workers, managers, and supervisors. We learned how to clock-in and clock-out every day for work. Now we’re at a phase where machines have become networked. I took a look at my desktop before we started this call and I counted eight different motors, all inside devices controlled in one way or another by networks. How will the networked machines we interact with every day change our behavior? As everything becomes networked, machine will have access to cloud intelligence, will collect data, and will make inferences and identify patterns in that data. Your mobile phone does this now. There’s a project underway that listens to small changes in your voice patterns and by doing so can detect and diagnose the early onset of Parkinson’s disease before any human diagnostician could. That hints at a world where not only is everything listening, but something like a phone can essentially become a diagnostician. We can begin to see the value of collecting data and automating processes that quietly run in the background, yet provide huge value when we think about public health or public safety. They could detect not only diseases, they could also detect risks or dangers. I have a blood pressure monitor at home. It’s in my drawer and it stays there most of the time. It’s a hassle to pull it out, put in on, and plug it into my phone. It would be better to have a device that senses and collects that data automatically, without me having to do anything. I think so too, but it’s not without controversy. A world where everything’s listening raises questions about who’s listening and why, and about whether or not we’re ready for things like this. But that’s always the case — technology is always ahead of our acceptance, whether or not we’re ready, individually or collectively as a society, for the things that technology can do, either on its own or with us. As part of your research, you looked into the way products will change when they become networked with the result that people are not buying products anymore, they’re buying outcomes, and the products themselves are always improving. We call this “evolvable hardware.” One of the best examples is Tesla, the car, which is networked and collects data. Tesla, the company, can modify the cars through over-the-air software updates that enhance and update the experience. This kind of thing is not limited to cars. We already see it with our phones. Part of this research is to challenge us with the idea that the capabilities we currently find in our phones are going to find their way into in everyday objects. New toys will continuously capture and sense data and use that data to enhance the experience with the child. It will also access cloud intelligence to be able to have those interactions with your child. It will also evolve and as we create new software or as the manufacturer of that toy creates new software. I want to go back to jobs again, because that’s on everybody’s mind. What did your research show about people losing their jobs to smart machines? Experts are divided. On the one hand, you have experts arguing that 45% of the jobs we know today — not just manual jobs but jobs in the more professional sector like lawyers and doctors — will be automated away. What that means, one argument goes, is that humans need to keep moving up a scale of value and focus on things that machines can’t do. Then there’s another camp that says, “Yes, jobs may go away and be destroyed, but in the process, we’ll create new kinds of jobs that will replace the jobs that are destroyed.” And again, what that means is that humans need to level up in order to fill those new opportunities. One of the interesting signals that you found was a hospital robot that workers like so much they have given it a name. You can think of them as robot orderlies. They’re at the new UCSF Hospital in San Francisco, which has completely automated its pharmacy. When an order comes in from a doctor who, let’s say, is in a patient’s room, it goes to the pharmacy. But instead of error-prone humans reading the script, sorting out the pills on multiple shelves, packaging the pills, and delivering them back up to where they’re needed, this is all now automated. Machines with mechanical arms put the pills into little packs that are handed over to little robotic orderlies that have full reign across the hospital to deliver the drugs to where they’re needed. The physician or the nurse that has the appropriate ID can open up the robot and select the prescription that they need for their patient that’s in front of them. Again, this is not without controversy. Optimization, efficiency, and accuracy are great things, especially in a hospital setting, but it raises questions. How do we balance these high tech approaches that are coming to healthcare with more high touch, more human approaches that we all like when we experience illness or are in a hospital? How do you envision this kind of automation moving from the enterprise into our homes? That same automated prescription service, which is inside the hospital, is also coming directly to the consumer in the form of automated shopping systems. In this case, an automated system will organize all your prescriptions and seal them into daily packets that are delivered to you with the date and time they should be taken. This not only makes the process of ordering and getting your pills much easier, it goes a long way in supporting the issue of adhering to your medical treatment. The orderly bot is a great example of human-machine symbiosis, and its job is one that you would expect a robot to be able to do, because it’s based on following specific instructions. But you also found that intelligent machines have a place in more creative environments, too, such as website design. What happens when artificial intelligence gets better at creativity? Will this will make things better for artists or if they should be nervous about losing their jobs? Again, another highly controversial area. How do we balance the affordances of technology with the affordances of human touch? As in hospitals, there are going to be similar debates in the art world. Art has been held up as one of those last frontiers. The example of the automated web designer and other examples like robots that paint good forgeries of interesting art pieces, point to the possibility that machines are a creative class. Whether they’re designing websites on their own or creating their own art, machines and automation are moving into the creative artistic realm, and it’s an area we’re going to have to contend with. We need to be open to thinking about how can we create new music and new art with machines. As we see more automation in the world, and as jobs are automated away, humans need to keep jumping to the next step of value and search for the things that humans are uniquely capable of doing on their own without machines. Our research found that not all automation leads to the destruction of jobs. We can evolve together and we can design for symbiosis rather than the opposite. Let’s talk about how machines can make complex decisions. In your research, you reported on a machine that helps people stop smoking. What’s the significance of that? This signal comes from a startup in the Bay Area called Chrono Therapeutics. In the same way we think about enterprise level support systems for decision-making, we can now begin to think about individual or body-area support systems for decision-making. Chrono Therapeutics has created a system that combines a phone app with a wearable patch. It’s networked with physicians and pharmacy. The most fascinating thing about it is that it’s a system that is constantly on and monitoring your body and any cravings you might get that would lead you to picking up a cigarette and smoking. As the system anticipates a craving, it will give you a dose of nicotine through the patch and hopefully that’s sufficient to overcome the urge to smoke. In the past we had systems that might have simply delivered a message like, “Don’t smoke,” but in this case, it’s a completely closed loop system that skips over the need to change behavior and instead monitors the body, anticipates urges, and delivers the nicotine to prevent smoking.They’re starting with tobacco and nicotine, but you might see a similar system for people that have hypertension, for example. There are many kinds of illnesses and conditions where we can just skip over the need to rely on behavior change and simply automate adherence to taking medication. A lot of IFTF’s work makes use of something called combinatorial forecasts. Could you explain what combinatorial forecasts are and how IFTF uses them? One of the things that we do at IFTF, especially as we think about the future of technology in any area, is ask ourselves, “What are some of the major foundational technologies that are shaping the future of technology in our world?” You can think of each of these foundational technologies as being a force for change and possibility in their own right, but oftentimes in combination, they open up totally unexpected, unprecedented possibilities. So as a practice, we take these foundational technologies and combine them and look at the possibilities that might emerge as we combine or think about their intersection. Walk me through the process of a combinatorial forecast. For this body of research, we produced a map that describes the future of the automated world, and we also created a toolkit as a companion piece. It’s about 18 to 20 different foundational technologies on cards. For example, you might lay out three cards that say “machine learning” and “computer vision” and “human machine interfaces.” The challenge is to think about what would emerge at the intersection of these things.Machine learning’s going to give us more anticipatory systems, computer vision is going to make every kind of data about the human experience computable, and human machine interfaces are going to open up new kinds of interactions with everyday objects. If you’re coming at it from an issue of the future of work and jobs, you might think about new jobs at that intersection. If you’re thinking about it from, let’s say, from the future of food, you might think about packaging, and what does that look like? At IFTF we went through that same exercise and came up with our own combinatorial forecasts, which are reflected on the map. We ended up with five building blocks for the automated world. We called them: Encoded Judgements, Continuous Capture and Sensemaking, Simulating Complex Decisions, On Demand Intelligence, and Evolvable Hardware. I’ve participated in a number of expert workshops at IFTF. The workshops include IFTF staff members, experts from IFTF’s extended network, and representatives from member organizations ranging from Fortune 100 companies to government departments. What impresses me is the way IFTF designs the workshops to stimulate everyone’s process of discovery and decision-making. The exercises encourage everyone to combine ideas and signals and get some cross pollination and get their creative juices flowing. Is that something that IFTF has been doing since it started almost 50 years ago? At the institute, we’re always trying to bring the best tools and the best strategies together to immerse people in our community into future possibilities, and a lot of these strategies and new tools are things that anyone can use. We’re always trying to model things so that our members and the people that we work with can do similar exercises back home, whether that’s with their teams or in their neighborhoods with community groups. A lot of our work has moved toward being more visual, being more modular. Our toolkits are made with the notion that the future belongs to everyone, that we’re all capable of thinking systematically about the future, and a lot of our maps and tools reflect that thinking. We find that people like to be provoked and surprised, and there’s a big wow factor to thinking about the future, but ultimately people want to create their own futures. I often tell people I don’t think there’s any point in anticipating the future unless they’re going to do something about it today and a lot of our tools and processes have been developed to build that capacity in people, not only to anticipate the future, but to start working on it today and bring it forward. 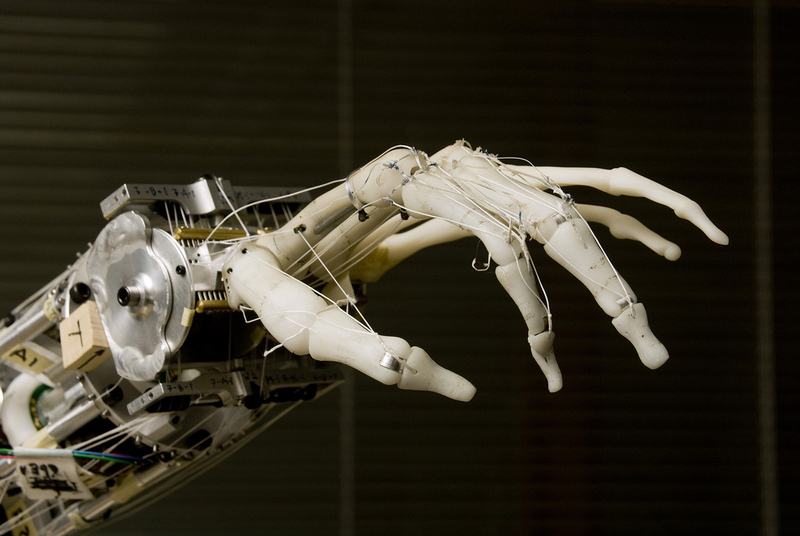 How should organizations prepare for the future of human machine symbiosis? Focusing only on how automation will transform the enterprise and the future of work tells an incomplete story. The challenge is to think about the future of automation at different scales: at the scale of the individual, the scale of the enterprise, and at the scale of cities. By moving up and down scale that way, it will open us up to new possibilities in ways that we might not have seen before.